the color of winter is in the imagination. 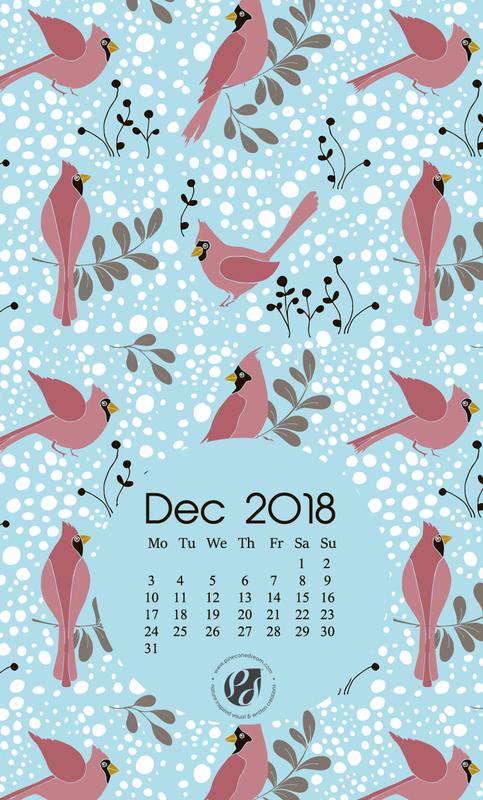 Download these bright and cheery December 2018 calendar wallpapers for your desktop, smartphone, and the printable monthly planner – made with my exclusive hand illustrated surface pattern collection! On winter’s snow-laden white landscapes, he appears from nowhere. It looks like nature is blushing in the cold. He sits on that priced branch of birch in front of my home’s deck. Priced, because before visiting my bird-feeder, they all pause there, inspecting, and more importantly, deciding, whether to come down on the deck or not, whether it is safe to descend. It is always safe. It’s just that this girl is constantly stalking them! I talk to this Cardinal. At times he looks at me. It’s almost as if he knows that I am talking to him. Sometimes I ask him questions. Most of the times he flies away quickly. But in some precious moments, he keeps looking at me. Then on rare occasions, I find a gorgeous red feather on the old pine floor of the deck. And I am left wondering, was it an answer to my questions? During the Christmas season, in the cold, colorless days of winter, Cardinals are seen as symbols of faith and warmth. Every December, while the snow is falling, I see them flying in and out of the patio. The intriguing color palette it all creates – the bright red of the Cardinals, the white of the flurries and the brown/black of dry twigs and fallen leaves on the snow-laden ground, fascinates me a lot and inspired me to create this quaint and sweet, hand-illustrated surface pattern collection as I wait for the December snowfall. Let me know how did you like my this design in the comments section below! All files are Copyright ©2018 Pineconedream & for PERSONAL USE ONLY. You cannot modify, distribute or sell these calendars/wallpapers in any form! I love cardinals, Thank you!